From our founding in the summer of 2012 through the end of 2014 (And from time to time ever since) Big Blue Door presented the BIG BLUE DOOR JAM, a show of true 6-8 minute stories on changing themes in changing venues. Volunteer teams of audience judges picked favorites. The storyteller with the most votes won a jar of jam! Twice a year we brought back jam-jar-winners and runners-up from the Door Jams for our BIG BLUE DOOR SLAM. For the Slams the whole audience voted and the winner home a trophy! Sadly, we had to stop regular storytelling shows when co-founder Jen Jones went back to work, but we’d love to partner with other organizations for future storytelling, and we offer storytelling classes once or twice a year. Email shows@bigbluedoor.org if you’d like to produce a storytelling show, and email classes@bigbluedoor.org if you’d like up to date info on Big Blue Door classes. Thanks to everyone who made the Jams and Slams such a wonderful experience for us! We’ll be back with a new storytelling format soon! Big Blue Door stories are back with Stories Confidential for the summer of 2017 at Belmont Arts Collaborative. It’s a brand new ‘best-of’ format featuring graduates of our classes and shows! Where are the rest of the upcoming topics?? This Thursday will be the last Jam till September! 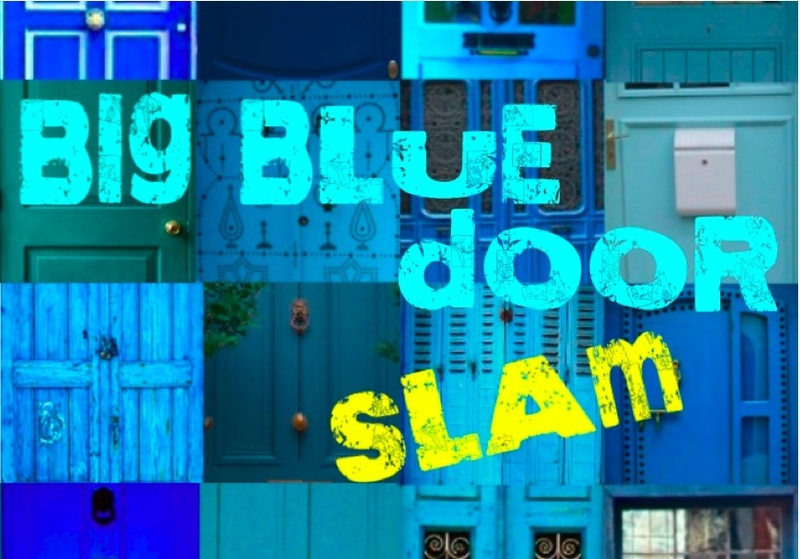 (In June we’ll have our semi-annual Big Blue Door Slam, bringing back top vote-getters from the first half of 2014.) Then no storytelling shows in July or August. In August we’ll announce the fall topics! Any plans to bring this back for 2016? Not in the summer or early fall 2016. In storytelling news we have a Telling True Stories class that just started up, we’re in the process of creating (in cooperation with a wonderful local radio station that we’ll announce soon) an accessible cache of recorded stories, and we keep hoping to get a collection of stories published. If all goes well we’d hope to offer another Telling True Stories class in the late fall, and start a new story show in early 2017.